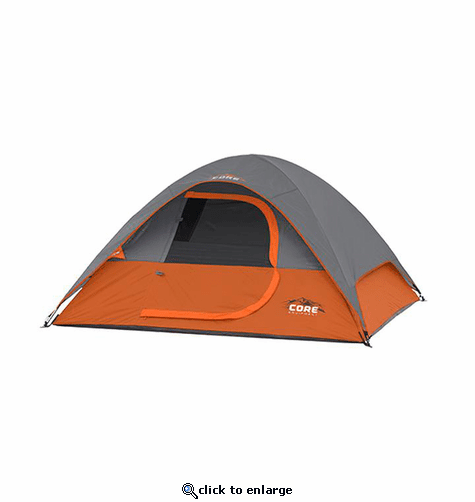 The Core 3 Person Dome Tent 7' x 7' features Core H20 Block Technology- water repellent fabrics with active bead technology for faster water runoff paired with sealed seams and rain-resistant door/window seals. The fully-taped rainfly is removable in warmer weather to expose panoramic mesh windows and ceiling. This three person dome tent also features zippered privacy panels on doors and windows and keeps your gear organized with the included gear loft with lantern hook and organizer pockets. Floor Material: Durable 115gsm P.E. We left our corporate gigs with the big name outdoor brands and started a company in the heart of the Midwest with a focus on elevating the camper's experience, a company we could be proud of. As a privately owned, founder-led company, we're able to work fast and respond to our customers' needs without anything getting in our way. We invest our time in quality engineered features, customer support, and great design. We are working towards a better camping experience for everyone; breaking down barriers, through education, that have made camping seem difficult or intimidating. While today's outdoorsman participates in a broad range of activities, they all have one thing in common-their gear should never hold them back. Our mission at Core is to create products that will enhance all your outdoor adventures, whether they are in the backyard or the mountains. Core is a small team of camping enthusiasts dedicated to helping everyone discover the wonders of nature and the simplicity of camping. Staffed by artists, designers, and business gurus, we believe any time outdoors is better than none, and that you don't have to be a seasoned professional to get out there and explore. As a result, we built a team whose goal is to provide products that encourage everyone to find the outdoorsman within. When we're not at the office, you'll find us biking wooded trails, camping (obviously), working on our latest DIY, or on a constant search for the perfect cup of coffee.